In 1869, two well diggers in Cardiff, N.Y., unearthed an enormous figure made of stone. More than 600,000 people flocked to see the mysterious giant, but even as its fame grew, its real origins were coming to light. 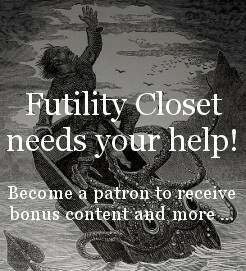 In this week’s episode of the Futility Closet podcast we’ll tell the story of the Cardiff giant, one of the greatest hoaxes of the 19th century. We’ll also ponder the effects of pink and puzzle over a potentially painful treatment. Edgar Rice Burroughs invented a variant of chess for a book set on Mars. Due to an unfortunate edict, a ladder in Jerusalem has remained unmoved for 200 years. Scott Tribble, A Colossal Hoax, 2008. Nate Hendley, The Big Con, 2016. Magnus Magnusson, Fakers, Forgers and Phoneys, 2007. Brian Innes, Fakes & Forgeries, 2005. Mark Rose, “When Giants Roamed the Earth,” Archaeology 58:6 (2005), 30-35. Barbara Franco, “The Cardiff Giant: A Hundred Year Old Hoax,” New York History 50:4 (October 1969), 420-440. James Taylor Dunn, “The Cardiff Giant Hoax,” New York History 29:3 (July 1948), 367-377. Michael Pettit, “‘The Joy in Believing’: The Cardiff Giant, Commercial Deceptions, and Styles of Observation in Gilded Age America,” Isis 97:4 (December 2006), 659-677. Julian D. Corrington, “Nature Fakes,” Bios 27:3 (October 1956), 159-169. Kat Eschner, “The Cardiff Giant Was Just a Big Hoax,” Smithsonian.com, Oct. 16, 2017. 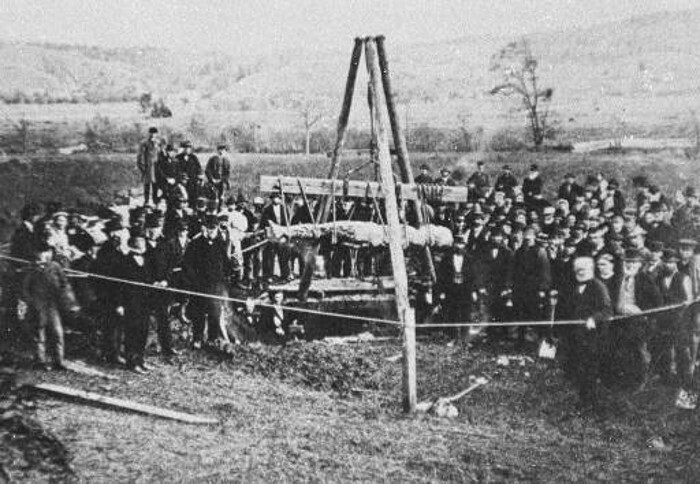 Jessie Szalay, “Cardiff Giant: ‘America’s Biggest Hoax,'” Live Science, Aug. 16, 2016. Ruth Mosalski, “Cardiff Giant Turned Out to Be Really Big US Hoax,” South Wales Echo, Jan. 21, 2017, 24. Gerald Smith and George Basler, “Hull Earned a Spot in ‘Con Man’s Hall of Fame,'” [Binghamton, N.Y.] Press & Sun-Bulletin, Oct. 6, 2014, 4. Ed Kemmick, “‘Petrified’ Man Was Big Attraction in Turn-of-the-Last-Century Montana,” Billings Gazette, March 13, 2009. Bill White, “Cardiff Giant, Piltdown Man — And Now Heydt Man,” [Allentown, Pa.] Morning Call, March 10, 2001, B3. “It Was a Giant Joke, Now Largely Forgotten,” Associated Press, Nov. 14, 1999, L3. Roger Munns, “19th Century Hoax Now Just an Interesting Relic,” Los Angeles Times, March 16, 1997, 11. Harvey Berman, “Prehistoric Giant Was a Hoax,” [Montreal] Gazette, May 18, 1991, J8. Bob Hughes, “The Cardiff Giant: How a Great Hoax Came to Life in a North Side Barn,” Chicago Tribune, June 2, 1985, 10. “Cardiff Giant in Suit,” New York Times, April 18, 1949. Louis C. Jones and James Taylor Dunn, “Cardiff Giant Again,” New York Times, May 23, 1948. “‘Cardiff Giant’ Sale Barred by Fort Dodge,” Associated Press, Aug. 4, 1934. “Syracuse Plea Fails to Get Cardiff Giant,” Associated Press, Dec. 6, 1930. Ruth A. Gallaher, “The Cardiff Giant,” The Palimpsest 2:9 (1921), 269-281. “Gigantic Hoax Fools Scientists,” El Paso [Texas] Herald, June 8, 1912, 10. “The Cardiff Giant: A Hoax That Took,” Coeur d’Alene [Idaho] Evening Press, April 15, 1910, 4. Frank Lewis Ford, “The Last of a Famous Hoax,” The Scrap Book 3:2 (April 1907), 221-223. 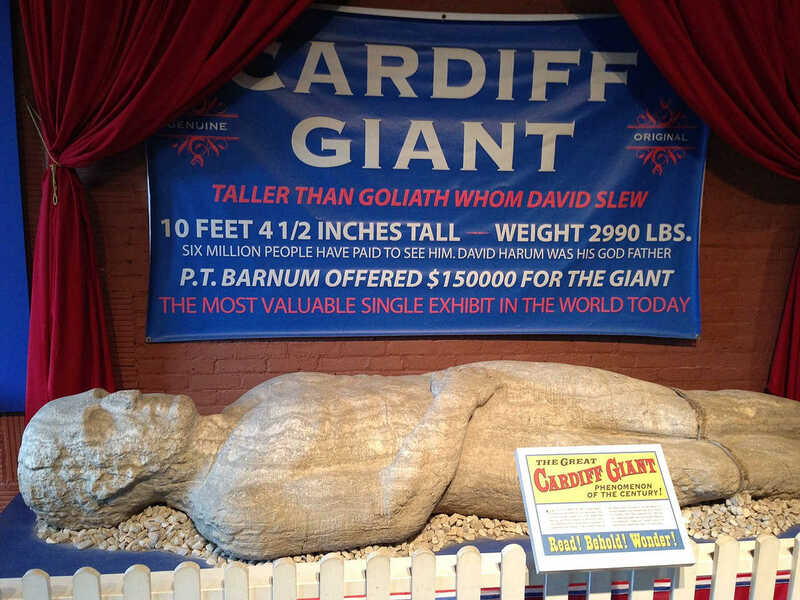 “Cardiff Giant Fake Recalled by Death of the One of the Sculptors,” Butte [Mont.] Inter Mountain, Nov. 8, 1902, 14. “Cardiff Giant Fake,” [Marshalltown, Iowa] Evening Times-Republican, Nov. 6, 1902, 2. Andrew D. White, “The Cardiff Giant,” The Century Illustrated Monthly Magazine, 64:6 (October 1902), 948-955. “The History of the Cardiff Giant,” Scranton [Pa.] Tribune, June 24, 1899, 11. “Cardiff Giant Fraud,” Salt Lake [Utah] Herald, April 23, 1899. “He Made the Giant,” Reading [Pa.] Eagle, Feb. 10, 1889, 2. “The Cardiff Giant,” in The History of Sauk County, Wisconsin, Western Historical Company, 1880, 547-552. “More About the Colorado Cardiff Giant,” New York Times, Sept. 30, 1877. “The Cardiff Giant’s Carpet-Bag,” New York Times, Dec. 10, 1876. W.A. McKinney, “The Cardiff Giant,” English Mechanics and the World of Science, 22:562 (Dec. 31, 1875), 393-394. “The Cardiff Giant Again,” New York Times, May 11, 1874. “Can a Married Woman Hold Property in a Cardiff Giant?” St. Louis Democrat, Dec. 12, 1872. “The Cardiff Giant,” College Courant 5:22 (Dec. 11, 1869), 347. “The Cardiff Giant,” Harper’s Weekly 13:675 (Dec. 4, 1869), 776. “The Cardiff Giant a Humbug,” Proceedings of the Massachusetts Historical Society, December 1869 meeting, 161-163. Today the giant resides at the Farmers’ Museum in Cooperstown, N.Y.
“About Us,” Town of Chicken (accessed March 15, 2019). “ptarmigan,” Oxford Living Dictionaries (accessed March 15, 2019). “ptarmigan,” Dictionary.com (accessed March 15, 2019). “Chicken of Chicken, Alaska” (accessed March 15, 2019). Wikipedia, “Chicken, Alaska” (accessed March 15, 2019). Danny Payne, “Paint the Town Pink: Iowa’s Unusual Tactic of Messing With Its Opponents,” Sports Illustrated, Sept. 24, 2015. Rick Brown, “Hayden Fry Jokes About Health, Pink Locker Room,” Des Moines Register, Aug. 30, 2014. Mark Snyder, “Michigan Football Covers Iowa’s Pink Visitors Locker Room,” Detroit Free Press, Nov. 12, 2016. Mark Wogenrich, “Penn State Readies for Iowa and Its Soothing Pink Locker Room,” [Allentown, Pa.] Morning Call, Sept. 19, 2017. Alexander G. Schauss, “The Physiological Effect of Color on the Suppression of Human Aggression: Research on Baker-Miller Pink,” International Journal of Biosocial Research 2:7 (1985), 55-64. Wikipedia, “Baker-Miller Pink” (accessed March 16, 2019). Oliver Genschow, et al., “Does Baker-Miller Pink Reduce Aggression in Prison Detention Cells? A Critical Empirical Examination,” Psychology, Crime & Law 21:5 (2015), 482-489. Morwenna Ferrier, “This Colour Might Change Your Life: Kendall Jenner and Baker-Miller Pink,” Guardian, Jan. 10, 2017. Natalie Way, “In the Pink: The Secret Wall Color for Dropping Pounds and Calming Down,” realtor.com, Jan. 12, 2017. Jake New, “The Meaning of Pink,” Inside Higher Ed, Aug. 29, 2014. Kabir Chibber, “Sports Teams Think the Color Pink Can Help Them Win,” Quartz, Aug. 22, 2018. “Norwich City Paint Carrow Road Away Dressing Room Pink,” BBC, Aug. 20, 2018. “Norwich City Stats,” FootyStats (accessed March 19, 2019). This week’s lateral thinking puzzle was contributed by listener Neil de Carteret, who sent this corroborating link (warning — this spoils the puzzle).